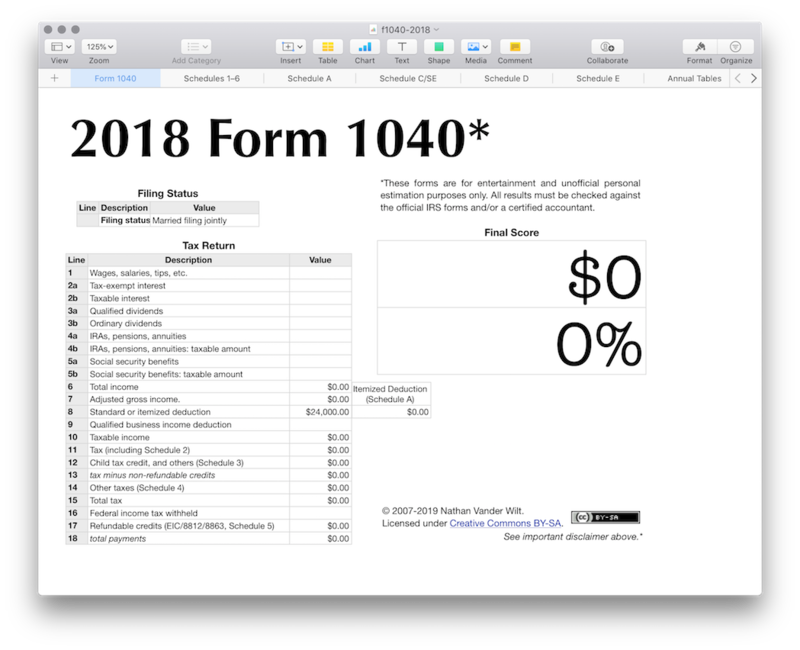 Soon after Apple first released their Numbers app, I started using it in my tax preparation and uploading my worksheets as a template here. The spreadsheet started with automatically updating tables for the main federal Form 1040, and gradually grew to include some helpers for Schedules A/C/E that I use. For the 2018 tax year, in order to more effectively trash the planet, there were some tax changes (pdf) as well as some even more gratuitous "changes" to the tax form. Never one to let politics spoil my productivity (← macabre humor there), I did take the opportunity to clean things up a bit. Besides splitting up chunks of the main Form 1040 into Schedules 1–6, I started getting the Schedules A/C/E more fully aligned with the actual forms. UPDATE: posted a new version with some important corrections, and some other potentially-useful additions. Please let me know if you find this helpful and/or do discover any issues with the calculations or annual data. Copyright © 2012 Nathan Vander Wilt. All rights reserved. Limit one offer per coupon.